Northland is fighting a growing number of invasive marine species that threaten our underwater ecosystem. Species such as Mediterranean fanworm compete with our native ones for food and space.Their dense colonies have the potential to impact on dive tourism, aquaculture and fisheries and become a nuisance for recreational and commercial fishers. The Mediterranean fanworm is spread on the hulls of boats and on equipment. Inspecting boat hulls and educating boat owners are two of the top three tools we have to help stop the spread of this species in Northland. But with limited resources of time and money, how do we get more hull inspections done and focus our education on the right audience? We used technology to implement a two-part solution that streamlines and automates the business process for capturing survey data in the field and the reporting process when an infected vessel is found. The location of moorings to be inspected is extracted from IRIS (Our Regional Council Regulatory System) and displayed to contract divers on a map via an iPad. Using ArcGIS Collector in the field, our contractors bring up their work area on a map and locate the mooring to inspect. (The display has basic information about the name of the boat and the owner that should be found on that mooring). Divers complete their inspection and enter the information straight into the form on their iPad. The information is synced into our internal Geographic Information System (GIS) application for the Biosecurity Officer to monitor progress of completed inspections as they turn from red to green when they are submitted. If a vessel or structure is found to have fanworm on it, the contractor creates an incident report via our eServices portal on the iPad. Fields are pre-populated where possible and other required information is entered into fields from pick lists (e.g. The scientific name of species that are found). This makes data entry easy and ensures accurate and consistent information is collected from multiple contractors. The incident report creates a work request directly into our regulatory system. There is no manual data entry or re-keying of information as the eServices data capture form has been fully integrated into IRIS. The incident work request is workflowed directly to the biosecurity officer for further action. On average, contractors are saving two hrs per day that was previously used to manually input data into a spreadsheet and send to us via a dropbox upload. This is no manual re-keying of information at any stage of the process. On average, our staff are also saving two hrs per day collating information and re-keying information into our regulatory system. These time savings can now be spent inspecting more vessels. The graph below illustrates the increased number of inspections that were undertaken this summer compared to last summer. This increase can be attributed largely to the improved efficiency of the data gathering process. Scientific names are automatically assigned to the record as it comes in. Accurate date, time, location and vessel information is also supplied. This saves staff time having to specify the name in the system and provides more accuracy and consistency in the spelling of the species information that comes in from contractors. Photos taken are on the iPad are also linked when the data is synchronised. Because the process is so easy, contractors have been able to collect additional information such as a score for the level of fouling on the vessel. Staff can now correlate factors such as the level of fouling with the risk of having fanworm. From this, they can inform decision making around rules in the Regional Pest Management Plan and understand the impact new rules on particular sectors of the boating fraternity. Education campaigns can then be planned using this data to identify target audiences and key messages. 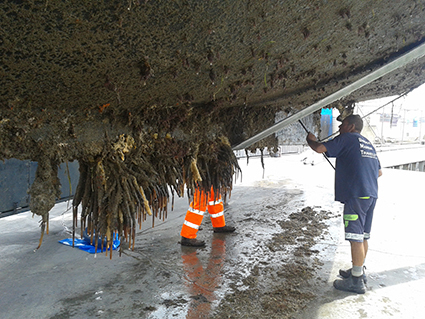 Prior to the mobile capture of incident reporting in the field, a contractor would text a Biosecurity staff member to let them know they had picked up an infestation on a vessel. Verifying information would require the officer to call back the contractor. If the initial officer contacted was unavailable and the information texted in was incomplete, it could lead to up to a day’s delay in being able to undertake enforcement action. The new mobile field capture solution creates an incident directly into our regulatory system and alerts multiple officers so incidents can be dealt with instantly. Council staff identified the opportunity to utilise recently implemented capability (ArcCollector) to provide a technology led solution to solve a real business problem, improving efficiency for staff and contractors and the quality and quantity of data being collected. This project was managed by one of our Biosecurity officers. There was a small team working on the project which included Biosecurity and GIS staff with the dive contractors we used to carry out the inspections. At Northland Regional Council, we have implemented a programme of project management workshops delivered by The University of Auckland. Teams are being encouraged to attend and work towards adopting these principles and templates for their projects. Costs for the project were minimal as the iPad was already owned and ArcCollector software licensing was included in existing licensing costs, with the cost of the contract fixed. Quotes recognising the success of the project. "It’s so easy for our contractors to use! The data coming in from them is much more consistent and accurate and we both save time on data entry. We have completed around 3 times as many hull inspections this summer than we did last year using the old system". "Arc collector and Sphere allowed us to collect and submit spatial and biological data efficiently whilst in the field. By integrating these programs into our field operations we were able to have a paperless system, streamlining the data collection and transfer process. It allowed data to be transferred to the master database in real time as we worked and reduced errors by having "drop downs" and GPS linking. By minimising the post processing requirements of the data we could increase the time spent on the water actually collecting data, resulting in overall increased productivity. If certain field observations triggered immediate response action from managers, Sphere allowed the reporting of the situation and relevant data required for the action through synchronisation, rather than using email/phone."